Today I am going to complete work on the outer pockets. These pockets are very different from the usual welted ones I have come accustomed to doing my Tennant Coats. So far I have made the flaps for the outer pockets and sewn them in place on the waistline seam (see right). The next thing I need to do to make this unusual pocket, is sew the back of the pocket bag, made up of a pocket facing (so if glimpsed, the inside of the pocket looks like it is the same material as the rest of the coat) and a pocket bag made from silesia, a durable cotton material commonly used for just this purpose (see left, top). The pocket backing gets sewn flipped upwards on top of the pocket flap. When this is put on my tailor’s dummy you can get an idea of how it is working (see left, bottom). I then need to sew the front part of the pocket bag to the top of the coat’s skirt, matching the position as closely as possible, working from the front edge of the coat (see below, top left). Then with the pocket bag halves extended out, I match up the skirt and body of the coat and sew only an inch or so either side of the pocket to establish its width (see below, top right). 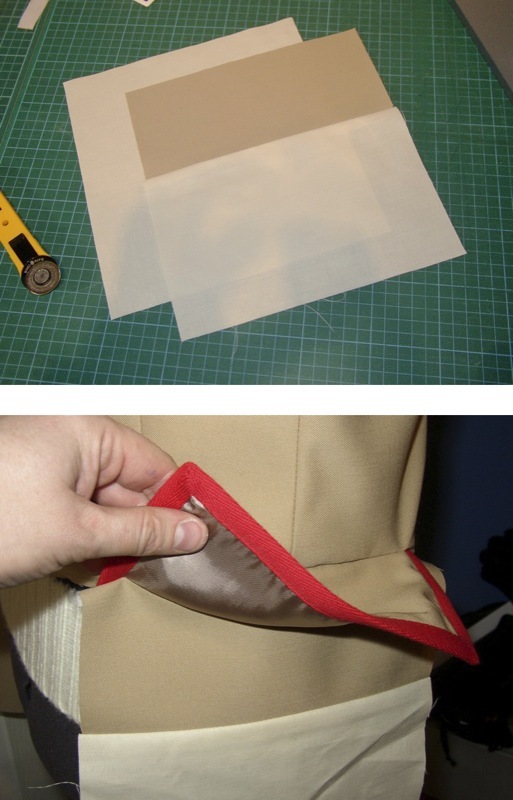 This give me the chance to quickly check I am sewing the waistline seam at the right level. Happy that it is okay, I finish sewing to the front of the coat on one side, and to the back on the other. To finish the pocket I need to now sew the pocket bag itself. It is very important to start precisely at the end of the waistband seam I have just sewn. Access to this is made difficult as all the other layers of fabric bulk together above it, preventing the foot of my sewing machine to get close enough to sew. To get round this I use a clever, but simple gadget I picked up ages ago and have hardly had use for. 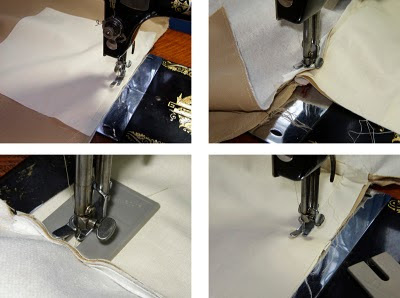 It is intended to help sew seams on jeans and is a thick plate of plastic with a slot in it which you put around the needle of the sewing machine (see above, bottom left). This then takes the weight of the machine’s foot and raises it to the level of the bulky work you are approaching. The foot then effortlessly glides off the block onto the bulky fabric and can continue sewing without stopping, but for what I need it helps me get right on top of where I need to sew. I can then turn and stitch the rest of the pocket bag (see above, bottom right). That finished the pocket off and the result looks very good (see below, left). The trick I pulled when I made the Pocket Flaps to prevent their corners curing is working a treat (see below, right). I then need to set the rest of the skirt in place, finishing the waistline seam at the back before continuing the seam line from the back curved seams right down to the hem. I had deliberately left this seam unfinished when I assembled the back, so that blending this panel in would be easier when I got to this stage. And that, amazingly, that finishes work on the bulk of the body of the coat. I need to move onto the lining next time, with its inside pockets, before rounding off the coat with the collar/lapels and the hem. Wow. Breezing through this one it seems! I just thought, is it difficult trying to keep such a light colored fabric clean with it constantly being worked on? Either way I really do like those pockets. Yes, as it happens it can be a bit of an unexpected nightmare! I have spent so long working with the robust Malabar, I had quite forgotten what a more conventional fabric is like!